Thinking about buying the Koldfront 24 bottle free standing dual zone wine cooler? Then you’ve come to the right place. Here’s a complete rundown of this product’s pros and cons. The Koldfront dual zone wine cooler has two separate compartments for you to keep red and white wine at their optimum temperatures respectively. The dual zone refrigeration system uses thermoelectric cooling, and the temperature of each zone is controlled through a convenient LCD display. Koldfront also offers a single zone version of this model, and also smaller and larger dual zone versions. The stainless steel trimmed, tempered glass door features a safety lock to keep youngsters out. The upper zone has a temperature range of 54° to 66° Fahrenheit (12° to 19° Celsius), while the lower zone spans from 46° to 66° F (8° to 19° C). 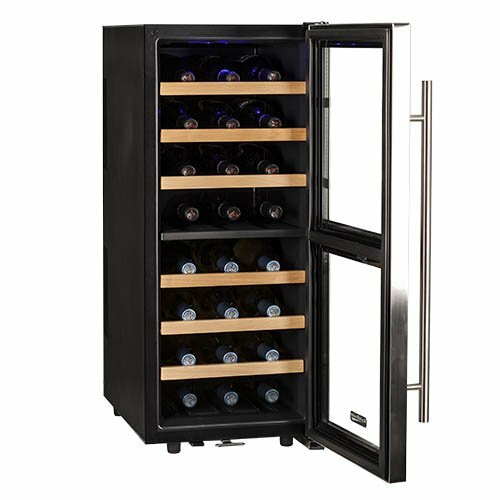 The Koldfront 24 bottle free standing dual zone wine cooler costs around $250. Now, on to the pros and cons. First, the good news. The refrigeration system is very consistent and maintains temperatures in each zone very well. The refrigeration unit is relatively quiet. The sound is gentle and usually not noticeable. The reduced noise also helps eliminate vibrations that may be harmful to your wine. It’s easy to set up, and simple to operate. The LCD display makes controlling the temperature very convenient. The design is sleek, classy and attractive. It looks like a quality appliance. The Koldfront dual zone wine cooler is generally a very good appliance, and works great all around. With that being said, it’s not perfect. There are still some notable issues with this product that shouldn’t go without mentioning. The number one issue with this product is that the door must be opened 180 degrees in order take out any of the racks, which you have to do in order to put bottles in them. If you don’t plan ahead for this when buying the wine cooler, it could cause a very frustrating situation as you may not be able to put it where you originally planned to. The door opens from left to right, and cannot be adjusted. It works best as a free standing cooler with plenty of space around it. This could be a deal breaker for some who want to put their wine cooler in a tight spot in order to maximize space. If you are aware of this issue ahead of time though, and have a good spot in mind already, it shouldn’t be a problem. The lowest temperature the Koldfront cooler is capable of is 46° F (8° C). That is generally fine, but if you want your white wine chilled more than that before serving, you need to transfer it to the fridge first and let it cool before opening. Champagne bottles and larger bottles of wine don’t really fit. You may have to remove one of the shelves and do some rearranging in order to squeeze the larger bottles in. A handle cannot easily be mounted. There are screws visible from the front of the door, but inside the door, the screws are not accessible. The wooden shelves fit in the cooler a bit awkwardly. If you’re not being careful, you can pull the whole rack out and let your wine bottles fall to the floor. You have to pay attention when pulling them out. Once the cooler is full, the lighting is not very good as the bottles block the light coming from the inner bulbs.